With Tops Supermarket recently closing, I’m reminded how grocery shopping in Fulton has changed over the years. Before Aldi’s, Price Chopper or Wal-Mart’s mega store, our favorite grocers were right in our neighborhood. For younger folks, that may seem hard to believe, but some longtime Fultonians know it’s true. Meeting with those friends got me thinking about the neighborhood of my youth. I grew up on the west side of the city, north of Broadway, and the two neighborhood stores I remember were Manitta’s and Sieron’s. Through my work with the Fulton Public Library’s Memoir Project, I’ve had the privilege of meeting and talking with two people who know a lot about those stores: Jean Sieron Niver and Dominic “Doc” Manitta. 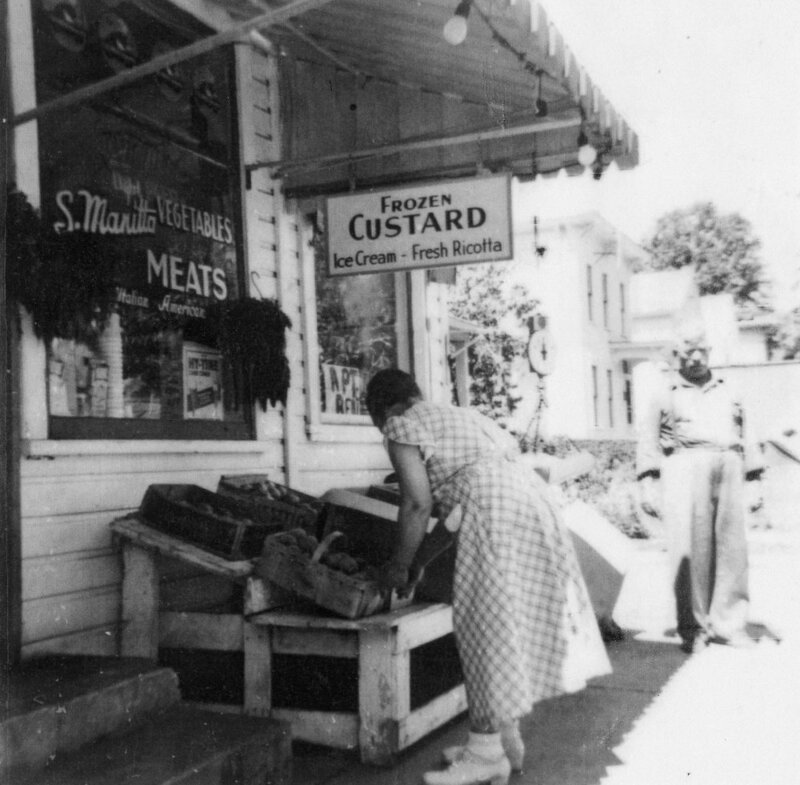 The story of Sieron’s, which was located on West First Street, begins with Jean’s parents, John and Genevieve Sieron, who opened the store in 1929. Jean came along several years later and remembers growing up in the store. “I had various jobs throughout my childhood,” Jean said. “I learned how to correctly bag groceries, stock shelves and eventually progressed to waiting on customers when I had learned how to make change (the old-fashioned way). “I bought my produce in Syracuse at the Farmers Market. All of us would be there at five in the morning, our trucks lined up, ready to go in and buy the best produce from the big retailers. We used to pick up bananas in huge bunches that would hang on a rack. For a long time we sold them for 11 cents a pound, and when I raised it to 12 cents my customers wanted to kill me! Today, the supermarkets where we shop have specials and sales, but when was the last time you saw people lined up outside a grocery store to take advantage of a huge discount? But people didn’t make regular visits to Manitta’s and Sieron’s just for good prices and high-quality food. They also knew that they’d be greeted by storeowners who were part of their neighborhood, and who welcomed them into their stores. Manitta’s grocery store, one of many neighborhood stores that were once found in Fulton.